I usually read a magazine while eating lunch at work, and Prevention is one of my favorites. Last week I came across a recipe that really caught my eye. I love cranberries, and I'm always looking for ways to eat more greens, so this salad looked promising. I have to say, it totally delivered. 1. To make the dressing, combine the cranberries, orange juice, olive oil, honey, shallot, water, ginger, and salt & pepper in a food processor. Pulse until finely chopped. 2. Toss salad greens, orange, and dried cranberries in a large bowl with enough dressing to coat. This salad is bright, beautiful, and bursting with flavor. I am on a pomegranate kick right now, so I added some pomegranate seeds which contributed even more color and texture. A handful of freshly-shelled pecans from David's grandma made an excellent addition as well. The balance of sweet and tart works so well in this salad. It's definitely a keeper for us (David loved it) and I can foresee lots of this salad in my future when our lettuce garden starts to boom this year! This looks awesome! Would love to have you share it at what i am eating http://www.townsend-house.com/2013/01/what-i-am-eating-11.html And freshly shelled pecans...wish I could have some of those! It looks beautiful! It must taste beautifully! I have to save it. I love the taste of cranberry and orange together! 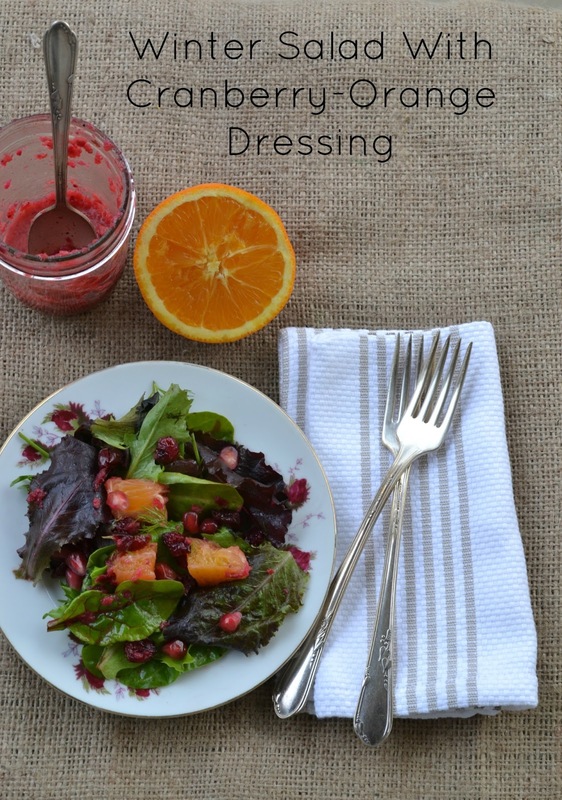 Cranberry Orange dressing....NOM, NOM, NOM!! I love all things cranberry, so this is a recipe that I absolutely MUST try! Hi Tammy I found your site via Farm Chick, sure sounds like a wonderful adventure you guys are on and i enjoyed my visit. This recipe looks delish, YUM! Thanks for sharing, i'll be giving it a try. Mmm - sounds and looks utterly delicious! This sounds JUST divine, Tammy! I love fruit in my salad, so this is right up my alley! yuuumm! Love a fruit and oil based dressing! Tammy-what a great recipe find! I love salads like this too, and the cranberry-orange dressing sounds heavenly! That looks yummy! !I love cranberry and orange...gonna have to try that!! Have a great day!! That sounds delicious. Steve just bought a bag of cranberries. I think this will be on the menu later this week. What a delicious salad - I love fresh citrus in the Winter, especially in a fresh salad! Pinning again Tammy! I think maybe I should just create a "Tammy Board!" This sounds wonderful from the dressing to the pomegranate seeds. Your photography is a lovely accompaniment to the recipe. It's all so appealing! One of my fav recipes ever (salmon recipe) is from Prevention. They do have some wonderful and healthy ideas. Great magazine! Thank you for sharing this recipe. The ginger and orange.. what a wonderful combination of flavors and SO healthy! I like all the color! Wow, your recipes are always so fresh and yummy! Thanks again! Wow - this looks pretty and delicious! I love the combination of cranberry-orange, but I'm thinking the addition of ginger puts it over the top - yummmm! Oh my goodness this is my kind of salad. Looks so delicious. I had e-mailed you about doing a review and giveaway of our products from econaturalsoap.com but I am not sure it went through. Oh wow! This looks SO yummy! Looks like a keeper to me!! Random...but I really like the way you styled these photos! I think I would like this salad....but I'd ahve to add some sort of protein...chicken or garbanzos!??!?! Have you added a protein to this? Loving the Cranberry Orange Combo here! This looks so yummy to me! Thanks for sharing the recipe!